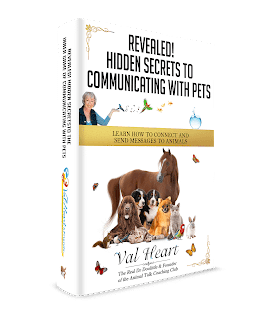 Val learned a long time ago that in order to help the animals, she had to be able to help their people regain balance, sanity and learn to deal better with their stress. That led Val on a long quest, looking for answers to the human – animal bodymind dilemma. Most of the time, whatever is wrong with your animals is coming from their human family as a reflection of their humans dis-ease, imbalances and woundings. Because your animals mirror you and could be acting out or carrying your dis-ease or illnesses, or in reaction to your own chronic stress or anxiety levels, Val requires that her clients fill out a BodyMind Assessment Questionnaire for themselves, as well as a Questionnaire for each of their animals. The Questionnaires often reveal hidden connections between you, that can then be addressed in your session. Val differs from other animal therapists in that she is highly trained in many coaching and alternative healing modalities. In addition to being certified in the advanced, state of the art healing modalities like The BodyTalk™ System (PaRama level) for both humans and animals, she is one of only a few practitioners trained in the highly effective and unique Fernandez Method™ of BodyMind Assessment. She believes that these proprietary methods of energy healing work is the Missing Link in healthcare today. 1) Pay for your Session. Click Here to Choose the Payment Plan that best suits your needs. 3 ) Send Val a Picture of Your Animal (only required for animal sessions). Email it to her, or snail mail to the office address below. 4) Fill Out and Return Val’s BodyMind Assessment Questionnaires! Many people notice that things start to change when they do this critical step. Scroll Down for the Questionnaires. Please fill out the BMA Questionnaire for Yourself, and if you would like Val to work with your animals, fill out the Animal Questionnaire (one for each animal). Instructions are on the form. Some people are surprised to discover that Val wants to know about YOU as well as your animal. That is because of the mirroring concept and principle. She’s discovered that often in order to help your animal, she has to help you with your issues and imbalances. It’s often true that what is going on with your own body, mind or spirit, is reflected in your animal companion’s behavior or health. What’s important to recognize is that many of these issues are not truly their issue, but your own. Or could be coming from their environment, management, or other unknown factor. Or as is often the case, is a result of many complex factors that must be addressed in order of priority. Your session actually begins when you start filling out the Questionnaire! Many clients say that they start to feel better just by filling out the Questionnaire. And often the problem that they wanted help with started resolving itself as soon as they contact her to make their appointment. 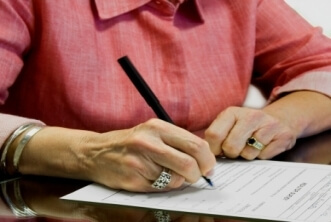 Others find that filling out the Form is an intense process depending on their situation and history, and things can get worse before they get better. That’s because the body is preparing for change, and what is coming up is surfacing so it can be cleared. The Questionnaires are used as focusing tools to bring greater conscious awareness of the real issues at hand, to bring us out of denial and task the BodyMind to go to work to balance the issues. Matters of Confidentiality: Your personal information is ALWAYS kept Confidential and will NEVER be shared with anyone else, ever. You are welcome to fill out as much or as little information as you wish and feel comfortable with.